You can't sleep, your energy levels are low and you're finding it harder to make it through your day. You've tried drinking caffeine, googled options to help you fall asleep faster and to sleep longer. The specialists insist there's nothing wrong, but you innately feel like something's out of tune. Maybe it's time to call the Chiropractor. D.D. Palmer, the Father of Chiropractic, recognized that repetitive physical, chemical and emotional stress can alter the normal 'tone' within a person's Nervous System (a.k.a. Subluxation). This persistent irritation can lead you down a slippery slope to poor physical, mental and emotional performance. The solution? Restore normal tone to the Nerve System with specific, Chiropractic adjustments to tune up your body and better health will naturally follow! Health is the 'music' that plays when all your cells, tissues and organs vibrate in perfect harmony – orchestrated by a finely tuned Nerve System. If you're feeling sluggish, weak and tired, a trip to the Chiropractor may just be the thing YOU need to get back in tune. A Positive Mental Attitude is indispensable to your success. You can be as positive as you want to be if you will simply think about the future, focus on the solution and look for the good. o Instead of worrying about who did what and who is to blame, focus on where you want to be and what you want to do. Get a clear mental image of your ideal successful future, and then take whatever action you can to begin moving in that direction. o Whenever you’re faced with a difficulty, focus on the solution rather than on the problem. Think and talk about the ideal solution to the obstacle or setback, rather than wasting time rehashing and reflecting on the problem. o Assume that whatever situation you are facing at the moment is exactly the right situation you need to ultimately be successful. This situation has been sent to you to help you learn something, to help you become better, to help you expand and grow. What happens when you plug ten appliances into one outlet and turn them all on at the same time? You blow a circuit! The same thing can happen when you surge an unprotected Nerve System with STRESS. Although it's impossible to turn off all the stress in your life, you can guard against unexpected surges with regular Chiropractic Care. Chiropractors perform their job like a surge protector - skillfully monitoring your Nerve System for overloads and ADJUSTING circuits back to normal when necessary. When it comes to fighting stress and dis-ease, nothing beats keeping your power ON with Chiropractic! The way you are today is not the way you will always be. The state of the world today is not how things will continue to be. Every moment of every day, transformation happens. By its very nature, life changes, and you can direct many of those changes. What kind of transformation would you like to see in your life, in your world? Now is when you can work to put life’s dynamic nature on your side. In countless ways, in every imaginable situation, transformation happens. Pain is transformed by healing, anger is transformed by forgiveness, despair is transformed by caring. Throughout history, transformation has improved lives. You can continue the tradition today. Instead of being resigned to, or content with, the way things are, remind yourself that transformation happens. Do everything you can to make it happen in a way that is beneficial for all. IT RUNS IN MY FAMILY: FACT OR FICTION? But did you know that only 25% of your genetic makeup determines your health? That’s right, only 25% (on the high side). This means that for all of us, we have 75% chance of changing our lives and our health. Our lifestyle determines what genes are turned on and off. Yes– those things you do each day whether it be having a soda with lunch, or exercising 3 time per week all change your genes. Ever ask why things “run in the families” it is because you learn from your family how to eat, sleep, deal with stress, etc. so it is important to be proactive. Our bodies are constantly regulating, turning on and off genes, so by living a chiropractic lifestyle you are changing your genetic makeup. We all have choices in life, and you can choose to change your lifestyle. By getting chiropractic, you are opening up nerve system disturbance that would otherwise keep you from expressing your optimum health potential. Add in healthier eating, exercise and a positive attitude and you begin to create the lifestyle that can enable you to live to 100. A Chiropractic Wellness lifestyle means optimizing nerve function so that your body can process your healthy habits more effectively. Congratulations for taking charge of your health and wellness! Do you know someone who can benefit from a lifestyle overhaul? If so, please refer them today! Scared of losing your mind? Alzheimer’s and Dementia are on the rise in the US. Come learn how to protect your greatest asset – your brain! After attending a recent seminar on Mending the Mind, Dr. Michelle will be sharing cutting edge information on what causes Alzheimer’s and Dementia and how to protect yourself and your loved ones. They come in all different sizes, shapes and colors. If you’re looking for a high quality, nutritious and filling snack, seeds are tough to beat. Sunflower: Munch them by the handful, or add them to cookie or muffin recipes, salads, and stir-fries. Hemp: Toss in salads, shakes, or smoothies, or sprinkle over cereal or yogurt. They also add texture to baked goods. Flax: Flax seed shells are hard, so grind them in a blender or coffee grinder first. Add the coarse or finely ground superseeds to smoothies, shakes, yogurt, oatmeal, cereal, casseroles, and when baking. Chia: Add to smoothies, yogurt, cereal, salads, or muffin batter. Always buy fresh from a market; never eat what came in a craft kit. In a recent Mayo Clinic study, researchers determined that nearly 70 percent of Americans are on at least one prescription drug, and more than half receive at least two prescriptions. Twenty percent of U.S. patients were also found to be on five or more prescription medications. When it comes to health, Americans aren’t as free as we think we are. Chiropractors believe true freedom comes from IN-Dependence - relying on the Power that made you, to heal you and keep you well. IN-Dependent Chiropractic patients know they innately possess what it takes to heal. They trust in the wisdom of their bodies to handle what ails them instead of running to the medicine cabinet for every cough or sniffle. They‘re the 30% who would rather give Mother Nature the chance to do her job, than usurp her roll with drug intervention. Big Pharma won’t stop advertising and pushing their products until we’re 100% dependent on them. This Fourth of July when you’re celebrating our country’s freedom, take a moment to reflect on your body’s freedom as well. Are you truly as IN-dependent as you want to be? Ingredients matter – learn if your brand leaves you over exposed to damaging UVA rays, if it breaks down in the sun or if it contains potential hormone-disrupting compounds. So utilize these healthy tips! Traveling? Cooped up in the car? Stuck in an airplane? Remember these easy tips to help keep your nervous system in check & enjoy your trip!!! Keep moving: Every 20 minutes while you are in the car change you posture! Move you seat forward and back, change the position of your seat back. If you have an adjustable lumbar change it too. Traveling by air? Don’t despair: Bring a sweatshirt or light jacket on your trip. Fold the shirt under your thighs while sitting or place it behind your lower back. Do this frequently during your trip to help relieve muscle tension associated with travel. Use Pillows: Most hotels or even staying at a friend’s house can prove to be uncomfortable when you are sleeping. Make sure you use 1 to 2 pillows under your knees (when lying on you back) or between your knees (when on your side). Also remember, that your pillow should equal the thickness of your shoulder. So, this is the ONLY time that we may tell you to stack two pillows together to equal this thickness and when possible take your own pillow with you! Take a hot shower: Hopefully you are already showering when you are on vacation. But if not, this one will do the trick. Take time to stand under warm water with it hitting the top part of you upper back. This will temporarily relieve tension and relax the body. This extra five minutes in the shower could greatly improve how you start your day! Water! Water! Water: The rules don’t change. Drink half your body weight in ounces. However, if you are at a high altitude or somewhere extremely hot or cold, you will need to increase the amount of water you drink. Don’t forget the greens: It is easy to travel and lose track of your eating habits. Make sure you have your veggies and strive for some balance in your eating. Do you know how much pounds of sugar the average American consumes? Can you name what the 5 common sources of Sugar that we consume?? Most people would agree that Sugar is addictive and some even know that sugar is toxic! Sugar is one of the leading causes of disease and degeneration in the body. If you are looking to reduce your risk of cancer and disease, shed a few pounds, or just fuel your body in a better way! These are things that when practiced daily by you and your children will create better health and wellness. It is the small decisions you make daily (what you eat, drink, do you go for a walk or watch TV, etc.) that add up to have the biggest impact on your health and wellness. The best way to stay in the 99.9% is to take care of yourself and follow the steps outlined below! Lifestyle DO’s to keep a charged up immune system! Sugar decreases immune function almost immediately. Get Enough Sleep. This is the time when your body is able to repair itself. Vitamin D3: children: 2000 IU/day and adults 4-5000 IU/day. Blood tests are available for you to figure out what dosage is best for you. This increases your circulation and blood flow around your body, also circulating the components of your immune system better. Have fun, enjoy your life! Don’t isolate yourself and your family in fear of getting sick because doing so will increase your stress and weaken your immune system. Instead, have a fun and positive attitude to promote increased immunity during times of stress. Adjustments are helpful because they release stress and tension in your body working to stimulate your nerve function which controls your immune system. Studies show that chiropractic is safe and effective. Getting chiropractic adjustments stimulate the immune system by 200%. The innate intelligence or 'organizing wisdom' within you is part of a greater intelligence that holds the entire universe in organized existence... YOU being the vessel in which it expresses itself. Your innate intelligence is not THE entire intelligence of the universe, but instead a part of it... limited only by the matter through which it manifests. And this intelligent, inner power which holds YOU together has one purpose - to sustain your existence on the planet. Here you are on a beautiful day, filled with positive possibilities. Here you are, to make it even better. You’re here today to be a source of joy, and to make life better. Allow joy to flow out from you, and experience how great it feels. Choose to simply laugh off what would normally annoy you. Overwhelm the situation with your own joyful smile, kind words and thoughtful actions. Be of service, be helpful, just because it feels so good and right. Put a smile on your face, in your voice and in your thoughts, and watch as your joyful expression spreads far beyond you. Mother’s Day is just a few days away. And in our eyes, Mother’s Day is a time for ALL women to be honored for all they do in our lives. Here are some things you can do, to make her day special. Thank her for getting you adjusted. To all women, thank you so much for all you do in our lives. The world is a better place with you in it. As for you, men and children, remember to support, love and appreciate them. Next, ask yourself if they are living the best life possible? If they have stress, we’d love to get them checked for subluxation today! A healthy mom means a healthier family and community! Choose local foods over organic foods. Often, locally grown foods are raised according to organic standards at a more affordable price. If all that’s available or affordable is fresh, conventionally grown produce, buy it, wash it well at home, and eat it. Look for local farms and food crops offering raw dairy products, eggs, produce, and grass fed meat. Skip prepared or pre-cut foods, which can cost up to double the amount as the unprepared versions. Plan your meals ahead of time (cook large batches and freeze) so you don’t splurge on expensive, unhealthy fast food at the last minute. Pass on junk foods like potato chips, soda, cookies candy and other snacks. These are a complete waste of money, even if they are ‘organic’. Buy lots of fresh veggies, they’re usually less expensive than canned versions (just make sure you use them before they go bad). Only buy what you need. Keep track of what’s in your pantry so you don’t double-up on foods unnecessarily. Clip coupons and use them when you can (just don’t buy something unhealthy because it’s on sale). Watch the register when you check out of the grocery store. They often ring up wrong prices, at your expense. Shop with a calculator so you can determine if it’s really a better deal to buy something in bulk or in a larger size. Watch weekly specials, and be aware of what’s really a good price. You can often find organic produce on sale for less than conventional produce if you know what prices to watch for. If you have the space, grow your own fresh veggies such as greens, broccoli, tomatoes, cucumbers, string beans, etc. Remember this rule of thumb. Fresh food is always better than frozen, but frozen is better than canned. Eating healthy is just one piece of the healthy puzzle. If you are interested in changing your eating habits or even want to begin a healthy vitamin regiment! Let’s take all the steps necessary to help you create greater health and wellness today for a healthier and happier future tomorrow! Spring is the perfect time to clean and detox your life. Take a moment for yourself to remove all the extra stress and busywork that seems to consume your day-to-day. To get you started, we’ve provided 9 easy ways for you to spring clean your world! 2. Eat more greens with every meal. 4. Check in on your goals. 5. Work out different parts of your body. 8. Organize your office space. Looking for more "OM" in your life? Have you been contemplating meditation? Do you want to know more? Or maybe you're not even sure how to meditate. I understand! I had all those same questions before I started meditation. Last month at our Wellness Workshop, we talked about how to peacefully & easily creating more life balance for the benefit of your health. Meditation is the next step to having balance which is crucial to your health! The Easter Bunny is the bearer of all things sweet, delicious, and right with the world. But this holiday doesn’t have to induce the same sugar high as Halloween. Here are 8 tips to survive this weekend. 1- Watch that basket - Focus on the meaning and the nonfood traditions of the holiday rather than the meals. I make one basket for the house so that all guests that visit can partake. 2- Don’t sit down to dinner on an empty stomach - You’ll be more likely to overeat. Make sure that you do not starve yourself so that you can sit down and “enjoy” a good meal. 3- Be active – Go for a walk or coordinate a street-wide Easter egg hunt or parade. You would be amazed at all the local offerings. Get outside! 4- Rethink that Easter basket- Purchase nontraditional gifts (books, costume jewelry, gift certificates) are even more appreciated than the usual candy, consider making healthy meal substitutions. The toys are not as cheap when we were little and will last. 5- Shift your focus -Remind yourself that holidays are not about a whole season, a whole weekend or even a whole day. Think about what is actually on the menu you are planning. Is there anything that you can tweak. You might surprise yourself and your family with something new. 6- “Un”-Chocolate Eggs –Instead of buying lots of candy, buy plastic eggs and fill them with stickers, money or small toys. This has become a big hit in my household. 7- Spread the wealth –Don’t buy a big bag of candy. But if it ends up that you have one: Share, share, share! 8- Change the sweets to natural sweets – Now is a good time to switch out candy for fruit that is in season. Most of all have fun and enjoy the holiday with others! "This book has changed my life...period. Laugh out loud funny, tear-jerkingly inspiring, temple-rubbingly thoughtful." "Possibly the Most Helpful Self Help Book I've Ever Read"
"Buy this book...in fact, buy several copies for friends and family!!" You've probably set goals to improve your lifestyle and get your health on track in 2017. The question is, are you hanging out with the right people to succeed? There's a saying that goes 'if you want to be happy, hang out with happy people.' The same can be said for being HEALTHY. Ever notice the people who hang out at the Chiropractor's office? They're generally health conscious and excited about Life. Most of them didn't start off that way. At some point they decided to maintain their spines like other happy, healthy Chiropractic clients and eventually became happier and healthier people themselves. If you're resolved to being more sick, more tired and more medicated, then hang out at your local pharmacy or hospital. On the other hand, if you're committed to renewing your health and improving your Life in 2017, then spend more time with people who can get you there. We'll be hanging out at the Chiropractor's office. GET ADJUSTED: WHAT IS HEALTH? Some people would say, “I feel good, I don’t have any pain, so I must be healthy. Or, “I don’t have any symptoms, so I must be healthy.” In fact, this is NOT what true health is. The World Health Organization defines health as a state of complete physical, mental and social well-being, not merely the absence of disease or infirmity. This means, that just because you feel good, doesn't mean you are healthy. The example that we use is one of the cavity. Your teeth have no pain today, but you wake up tomorrow with the pain of a cavity. The fact is, pain is the last thing to show up. This means the cavity had been developing for some time and only until the pain showed up did you know that it existed. This is why we utilize state of the art computerized technology to identify how well you are functioning. You see, nerve interference can be taking place and you would not know it. But by utilizing our technology, we can make sure that you are functioning properly and living a healthier more vibrant life! You know what you can do. Are you doing all you can? You know how capable, how effective you can be. Engage that effectiveness to its fullest extent today. Life has given you much. Now is your chance to give even more. Stop wondering where you’ll start, and just start right where you are. Quit asking yourself what you can do, and begin doing what you can. Rise calmly, confidently above worry, anger, ego and despair. You have good work to do, so experience the satisfaction, the fulfillment of getting it done. Today, you are new achievement ready to happen, new goodness ready to be born. Now, live up to all your potential. There’s much to love about Chiropractic - the science of nerve system function, the art of adjusting spines back into proper alignment. But the best part is the Principle behind it all. Physicians address body parts, psychologists analyze thoughts and clergy tend to matters of the spirit. But no one profession addresses all three – your physical health, mental health and spiritual health like Chiropractic. When Chiropractors clear your nerve system with an adjustment, not only does your physical body improve, but so does your mental focus and ability to express your true self. Love is the right adjustment at the right time. While the resolution of pain and restoration of physiologic function are nice side effects of Chiropractic - the thing we love the most is when you become whole again. Have a Happy and Healthy Valentine's Day! I've been a huge list addict for as long as I can remember! I feel so much more peaceful and content with myself when I've got a few lists going from what I need to do today to what my favorite songs were in 2002. I love lists! So in 2013, I started a project on my blog called the 52 Lists Project that is all about taking a little time to yourself once a week to reflect and recognize all of the power and love within yourself through list making. In the middle of 2013, I launched my retail site, mooreaseal.com, and then the next year I opened a brick + mortar shop in Seattle, WA! And with all of my busy work, it let my project fall to the way side. But because I missed it so much, in 2014, I secretly started the journey of transforming it into a REAL LIFE 52 Lists Project JOURNAL! The 52 Lists Project has been a phenomenal success since it's launch in September of 2015. You can find it on mooreaseal.com, at Amazon, and at over 200 boutiques, gift shops and book stores across the world! THINK WELL: LAUGH YOUR WAY INTO THE NEW YEAR! The sound of roaring laughter is far more contagious than any cough, sniffle, or sneeze. When laughter is shared, it binds people together and increases happiness and intimacy. In addition to the domino effect of joy and amusement, laughter also triggers healthy physical changes in the body. Humor and laughter strengthen your immune system, boost your energy, diminish pain, and protect you from the damaging effects of stress. Best of all, this priceless medicine is fun, free, and easy to use. So next time you are feeling like you need a little something, try laughing, and let your good health flow! A woman was worried about her family’s addiction to diet soda. After researching the effects of aspartame, she decided to perform her own experiment. She got 108 rats. For nearly 3 years she fed some of the rats the equivalent, for their body weight, of two-thirds the aspartame contained in 8-oz. of diet soda each day. Eleven of the females who took aspartame – 37% – developed tumors, some of massive size. Thought: Aspartame toxicity is the common denominator for over 92 different health symptoms. Cleaning up the ‘sugar free’ in your life is one way to create a healthier, longer and happier life. Take charge today, drink more water and get rid of the chemicals which can speed up the aging process. A Chiropractic Wellness Lifestyle is about learning the habits that will help you to live a healthier life. If you found this tip helpful pass it on or contact us today! So what’s with the popping associated with certain types of Chiropractic adjustments? Isn’t cracking your joints supposed to be bad for you? Not all Chiropractic techniques involve the ‘cavitation’ of joints (the escape of oxygen, nitrogen, and carbon dioxide, which releases joint pressure). Some use table or instrument assisted adjustments where no appreciable cavitation is experienced. The ones that do however are no less safe, comfortable and effective at reducing spinal fixation, clearing nerve interference (subluxations) and improving your health. As a matter of fact, it’s been shown by John Hopkins University that joint cavitation (specifically in the hand) does not contribute to the formation of arthritis as falsely believed by grandmothers worldwide! When you hear the noise from a professionally delivered adjustment, it’s similar to the pressure release you get from opening a bottle of champagne. It’s like having a party in your spine! Ultimately, with less pressure your joints move better, line up better and just plain feel better. Clark Griswold stands with bated breath and extension cord in hand as a childlike giddiness overtakes him. The family drum roll commences; he makes the anticipated electrical connection and VOILA... nothing happens. Clark obviously has a power problem. Although the extension cords are all connected and each individual Christmas light has been inspected with precision, he's still not connected to the source. It isn't until his wife 'adjusts' the switch in the garage and turns the MAIN Power on that the light show begins. She would make a good Chiropractor! If your wiring is connected and your body parts have all been dutifully inspected by the best doctors in the world, you still won't function to your potential if you're not connected 100% to your source... the Life Sustaining Power that flows from your Nervous System. DON’T GET THE BLUES THIS HOLIDAY SEASON! With the holidays quickly approaching, stress levels will be increasing. Most of us run our immune systems down in the weeks leading up to the holidays, and if we don’t take time to re-charge we may be singing the holiday blues. Why is this important? Your immune system is what fights off colds, the flu and illnesses. Your immune system becomes suppressed when it is under stress. The higher your stress level, the lower the level your body is to put up a fight against disease. Chiropractic adjustments increase your immune system by 200%!! That means your body is, much stronger and able to fight colds, the flu and illnesses than your non-chiropractic friends. Reduce or eliminate sugar intake. If you feel you are struggling to eliminate sugar, try Gymnema from Medi-Herb. It is a natrual way to take the craving and the ability to taste anything sweet. Plenty of fluids and plenty of rest. Remember, you can’t catch a cold, but you can get sick if you let your system get run down. You've been given the throw down. Your family and friends are egging you on to try their Chiropractor. But you don't 'believe' in Chiropractic you doubt it would actually work for your health problems. The question isn't whether you believe in Chiropractic, but do you believe in your body’s own natural ability to heal yourself? You see, Chiropractors don't heal anything. It's the innate doctor inside you that does all the healing. Chiropractors simply create a better environment (a clear Nerve System) for that process to happen. What do you have to lose? You've been to every specialist under the sun. You hate taking medication (both over the counter and prescription), and the idea of surgery scares you. 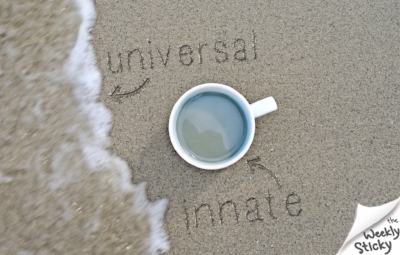 Why not call the Chiropractor and get connected to your innate? You'll be amazed at what the doctor inside of you is capable of doing - we triple dog dare you to try it! For most people, the holiday season is a stressful time of year. It’s not so much that the season stresses people out. Rather, the number of things to do, parties to attend, errands to run, friends and family to buy for, wrap for and cook for (oh! And work…) all get jam-packed into a very short five weeks. What if, this year, you were actually able to enjoy the holiday season? What if, you still got all the work, errands, presents, and parties accomplished and still had energy at the end of the day? Use these tips and create your own ways to find peace the season. You’ll get more out of each day and enjoy the holidays!! The opposite of being stressed is not ‘not being stressed’. The opposite of stressed is being at peace. Stress is draining. Peace is energizing. Stress is overwhelming. Peace is calming. 1. Create 5 minutes each day for yourself. Whether that’s during your morning coffee, an afternoon walk in the sunshine, or a quick soak in the hot tub. This is not a time for planning all the other things that need to happen. Rather a time for decompressing, deep breathing, and relaxing. 2. Plan your day. Rather than being frantic, a few minutes of planning at the beginning of the day, or beginning of the week, will optimize your energy expenditure – leaving some left over for you! 3. Take your vitamins. These essential nutrients help your body to function more efficiently. With so much to do this season, efficiency is a must in all categories! *If you're not sure if what vitamins to take, schedule an appointment with Dr. Michelle to get nutritionally tested to find out the best options for your body. 4. Sleep 6-8 hours per night. Quality is just as important as quantity. Sleep is your re-set button. When you’re sleeping, your body is repairing, restoring, and re-energizing! 5. Write down three things you’re grateful for. Being grateful changes your brain chemistry out of a stressed state into a peaceful state. Jot them in your phone’s notes section or start a Word document. Writing them down allows you to visually appreciate the blessings in your life. 6. Get adjusted. Chiropractic adjustments optimize your body’s energy and resources. Think of it as turning up the volume on life. You’re functioning more efficiently internally, allowing you to glide through the day’s requirements and activities, and have more fun! or almond meal like consistency. Pour into a small mixing bowl, add the butter and salt and mix into a thick dough. Using your hands, spread evenly into a pie pan and bake for 10 minutes. While the crust is in the oven, whisk all of the pie filling ingredients together. return to the oven and bake for an additional 45 minutes. Thanksgiving is a time to be grateful, especially for all of life’s many blessings. Expressing gratitude should not just be a thanksgiving tradition, but a part of daily living throughout the year. Research shows gratitude has an immense positive effect on physical and mental health. It’s obvious that reducing emotions like: stress, frustration and anger improve mental and physical wellbeing. Now, research also shows expressing gratitude and appreciation has a direct positive effect on sleep, well-being, depression and disease. Let’s face it: Expressing gratitude and appreciation isn’t always easy. It may be especially difficult when events or people fall short of our expectation. Don’t despair. Becoming a gratitude guru is easier than you think. Here is a list of suggestions to help bring gratitude into your daily living. · Keep a journal or gratitude list. · Find five things a day that you are grateful for, and write them down. · Place the list or journal in a place that frequently accessed. Locations could be: posted to the refrigerator, placed in a wallet or affixed to a computer monitor. · Start off slowly. It’s better to record a few true expressions of gratitude than false improvisations. At first, quality may be more important than quality. · Put yourself in others’ shoes before judging. Appreciate their contributions and perspectives even if they’re different from yours.